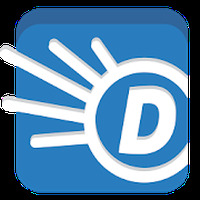 "The best mobile dictionary available on your Android"
App description: Dictionary.com is one of the leading, free English dictionary apps for Android, allowing you to search through, and expand your vocabulary, with access to over 2,000,000 definitions and synonyms. Functions: With the app, you can receive a word of the day, to learn a new word for each day you use the app, listen to the way every word is pronounced, search for specific terms with your voice, get translations for over 30 languages, learn fun, fascinating facts about language, take part in quizzes and loads more. How to use: It is very simple to navigate through the apps interface, either by using the search bar at the top of the screen or by searching by speaking into the app. Upon finding your word, you'll get a full definition of the word as well as how it is pronounced. Recommendations: For people of all ages who are keen to learn words to add to their vocabulary, as well as writers who might want to spruce up their writing with interesting new words. Platform: Android smartphones, tablets and Android Wear. Requirements: Android 2.3 and higher. Developer: Dictionary.com, LLC is based in United States	- Recommended developer. Installation requirements: A minimum of 10.14 MB of free memory space and Android 2.3 or higher. Rating: The TOP 5 Most popular Apps in Name Dictionary category. Ranking: The TOP 1 Most downloaded applications in Name Dictionary category. Huge database of words to browse through. Word of the day isn't useful to use in day-to-day conversation. Learn English fast and easy from your Android!